By using your own tracking URL recipients will not immediately notice that the email they just received from you was sent by a third party. Your overall deliverability will improve since some spam filters do notice if there is a discrepancy between your tracking links and your sender domain. Create a subdomain (e.g. newsletter.yourdomain.com) with the provider that hosts “yourdomain” and create a CNAME entry. You will find the necessary information on the CNAME directly in your account under [My Account] > [Settings] > [Domains]. Please make sure that this subdomain does NOT begin with numbers or special characters (e.g. we do not support domains such as 24newsletter.yourdomain.com). 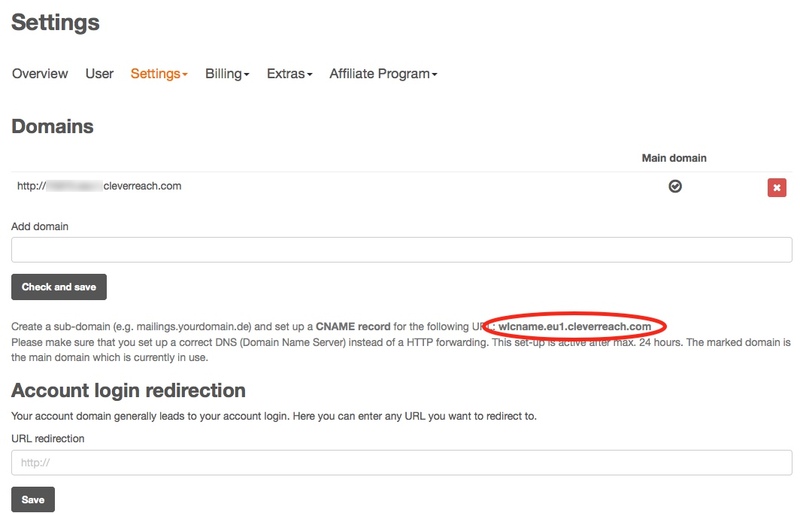 Also check that the correct DNS (Domain Name Server) settings are made and do not use a HTTP-redirect. Depending on your provider this setup can take up to 48 hours. What is a CNAME entry? A CNAME is a type of alias that enables correct interpretation of the DNS-entries of another domain. E.g. a CNAME makes it possible to reach the domain newsletter.yourdomain.com with the DNS-entries of 99999.cleverreach.com, without the site visitor even noticing. Once you have set up the subdomain (e.g. newsletter.yourdomain.com) with your provider you need to insert this information into your CleverReach account. Go to [My Account] > [Settings] > [Domains]. Enter the newly created subdomain into the field [Add domain] and begin the evaluation process. After this you need to save the new entries. If the message “This domain is not available” or “This domain does not point to the server” appears there is a technical issue with your domain (e.g. the CNAME entry is not correct or not yet active). Under Account login redirection you can enter any URL you would like to redirect to whenever your subdomain e.g. is entered into a browser. 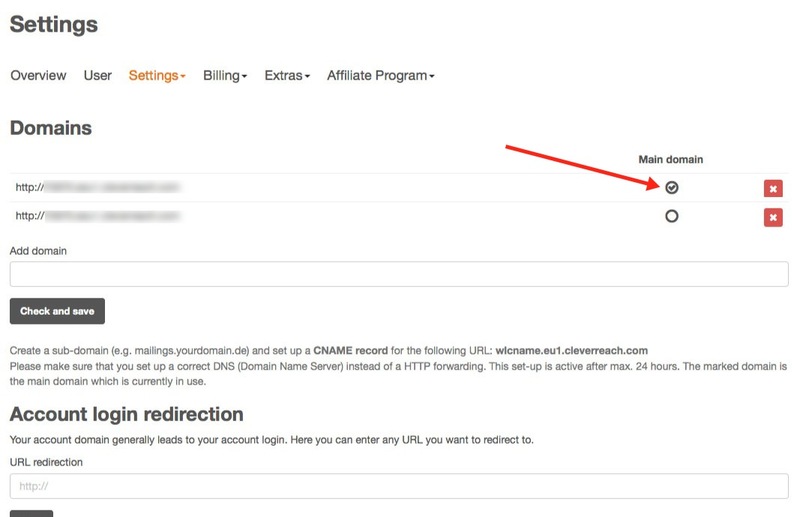 If you do not enter anything the redirect will lead directly to the CleverReach login for your account. This redirect also applies if e.g. you have deactivated the online version within your email campaigns. We do not support the use of A-Records, since domains no longer function if we switch our IP-addresses. Updating domain settings can take up to 48 hours depending on the provider. For this reason we recommend to wait at least 48 hours before using a new domain. The subdomain may not begin with numbers or special characters. Some providers demand that the CNAME end with a period. You can set up and use up to three domains. Should you need more please contact our technical support. Create a subdomain (e.g. newsletter.yourdomain.com) and create a CNAME entry. You will find the necessary information on the CNAME directly in your account under [My Account] > [Settings] > [Domains]. Create an additional wildcard domain for your future customers: *.newsletter.yourdomain.com and enter the same CNAME information as for your main domain. After 48 hours at the latest you should be able to select your domain as master domain under [Agency] > [Premium settings]. If you manage multiple domains in your account you need to define which one is the main (default) domain. Mark the respective domain as [Main URL] and save these settings. This will ensure that e.g. 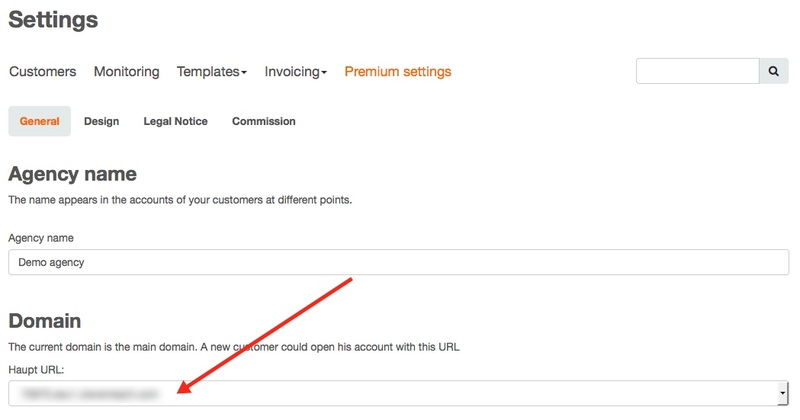 if you create a new email or form the main domain will automatically be used. Please note that SSL support is currently not available for your own domains. How can I use SSL in forms?